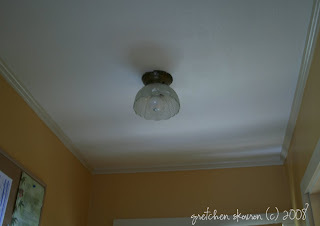 It all starts with a light fixture that I hate. The hunt to find something unique-looking and affordable. I'm not in love with anything at my local Home Depot, Lowes or Ikea. I searched at the Community Forklift and still left empty handed. And then one Friday I went to the forklift and found this light cover in the free pile. Now I'm not in love with it but I do like it more than what we originally had up there. For now it will do. 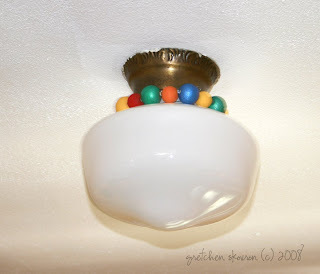 It was a little larger than the original shade so I used some strong wire to attach it to the base and then put some fun wooden beads around it to cover the wire. For now it will do...until I find that vintage, totally funky chandelier at a flea market that needs a face lift for dirt cheap.